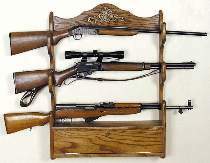 This traditional style gun rack has offset side cutouts so rifles sit horizontally. Door swings down for access to large storage area. Keyed cabinet lock secures ammunition. Measures 34"H x 24"W x 5-1/2"D. Plans drawn FULL SIZE.